How Do You Figure Out the Rate Traveled if You Know the Distance and Time? This tutorial provides a great real world application of math! Follow along with this tutorial to figure out how fast you need to go to travel a certain distance in a certain amount of time. What's the Formula Connecting Distance, Speed, and Time? 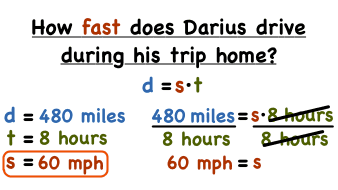 When you have constant speed, the same formula pops up over and over again, and that's the formula that connects distance, speed, and time. Make sure you know this formula, and if you want a refresher, check out the tutorial!